CG = Refers to Lorraine Massey’s “Curly Girl” method. The basic tenets are cone avoidance, no or low poo shampoos and co-washing. Cones = Non-water soluble silicones, such as amodimethicone, dimethicone, etc..
HIH = Hands in Hair (syndrome characterized by the uncontrollable urge to constantly touch twirl one’s own hair). 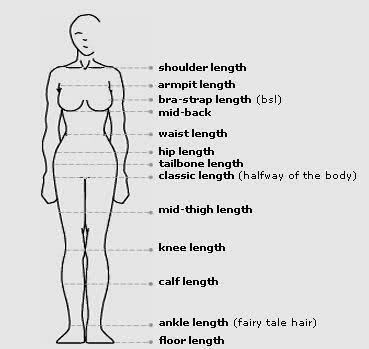 Notes: Shoulder length is the same as collar-bone length. Chin length and ear length, though not indicated in this image, are pretty self-explanatory;). May I make a suggestion? Slip in SNF (Sofn’free) right before SSK. I work with Sofn’free GroHealthy products and know that the company would be thrilled to see it up there, since the entire line is made for textured hair of all kinds. Thanks from Lisa and the rest of the SNF crew. I can’t find any other way of contacing you, so here it goes. I believe it was last week or the week prior–you posted an update from someone, and when o read her story, it hit home for me. She had her blog listed, and I went there and meant to bookmark it so I could come back and comment because I was on my iPhone. Well, long story short, my safari locked up on me and I had to erase history, clear cache, & reset. Needless to say, I lost the blog that I wanted to come back to. Is there ANYway you could send me her blog again? I don’t have her name correct, but it may have been Cas or Cys or Cyd…? I’m not sure. I do know that she was new to blogging and fairly new to the natural scene. She was also into fitness, using the couch to 5k app was something I remember her talking about. Hi Nikki! My email address is under the ‘About Me’ tab. Haven’t found a better place to put it yet. 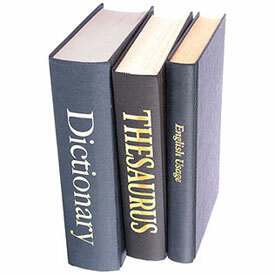 Do you think you may have read the review on Terressentials and went to Chy’sCurlz blog? That’s the only one I can think of to which you might be referring. If not, do you know if it was a GOC update or a Hairstory? You can search those posts using the tabs. Well, thank you sooo much for your readership and I’m so happy I was able to point you in the right direction. I’m loving that Chy’s Curlz is “playing at home” and was very excited when I saw that she is succeeding in her fitness goals. She definitely inspired me to try Terressentials in the New Year (after my twists … hoping to get a gift certificate for it from my Secret Santa at work;). Happy Holidays to you too;)! I’ve noticed that the shorter your hair the longer it takes to do it creatively. After working on my locks for hours I don’t have energy for much else. Very time-consuming right now!